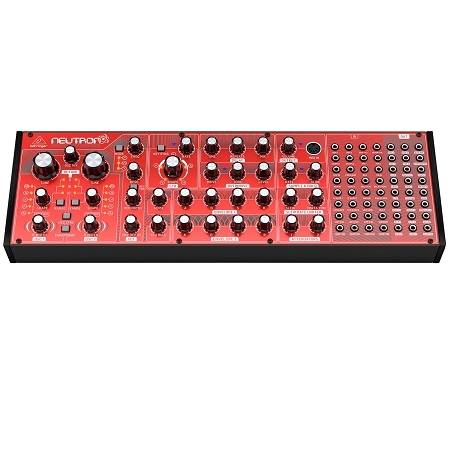 32-key Analog Synthesizer, with 4 Simultaneous Oscillators, Saw/Triangle/SquarePWM/SquareSub Oscillators, Resonant VCF, 6 FM Sources, 32-step Sequencer, and Arpeggiator! 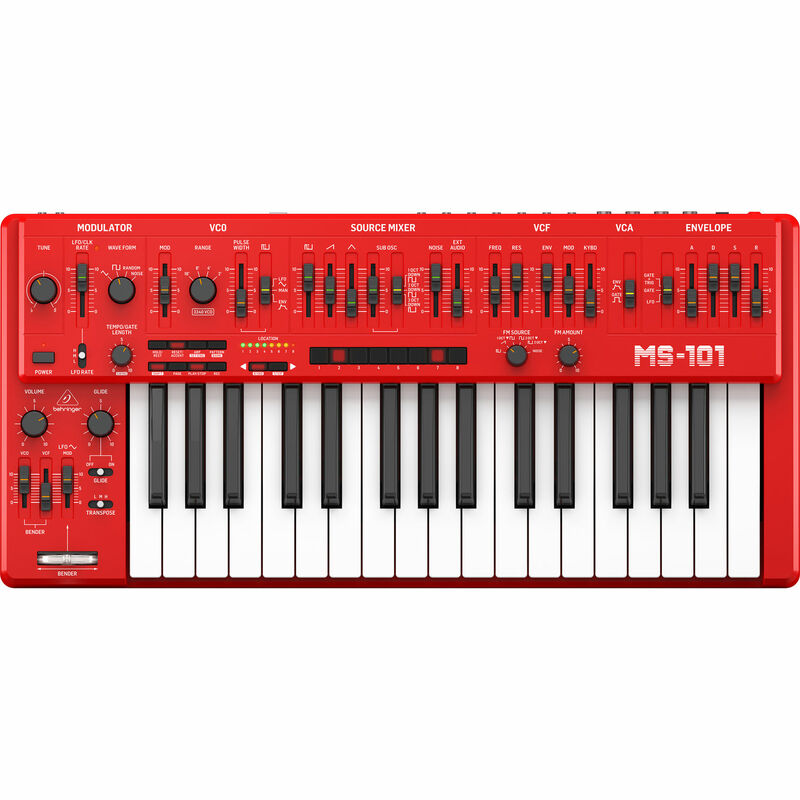 The Behringer MS-101-RD is a faithful recreation of the monophonic SH-101 with 32 full-sized keys and a pure analog signal path, it is well suited for creating a range of sounds from super fat bass and lead tones to mindbending effects. 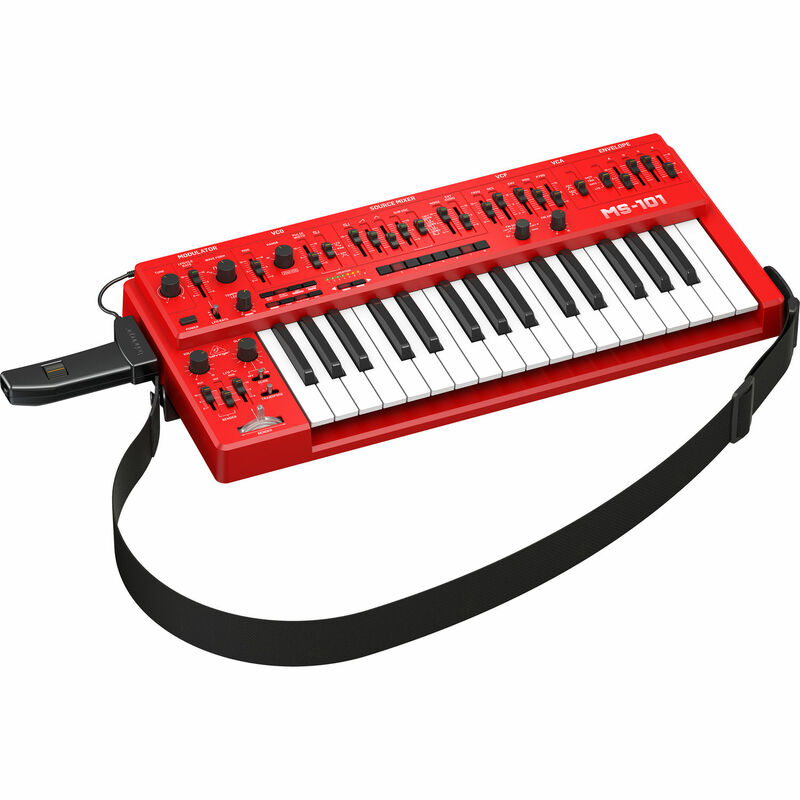 The included performance kit, which consists of an attachable hand grip and guitar strap, allows the instrument to be strapped on like a guitar for live performance. 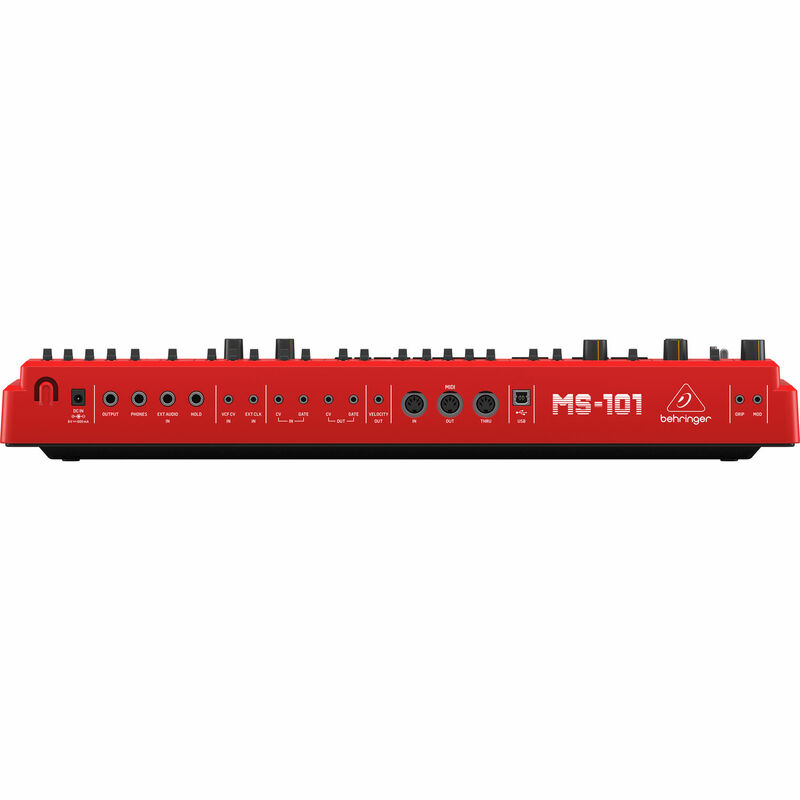 Additionally, the MS-101 is great for studio use with its standard MIDI DIN (In/Out/Thru), USB MIDI, and extensive 1/4" and 1/8" inputs and outputs, which allow for the connection to additional external gear such as other keyboards and modular synthesizers. 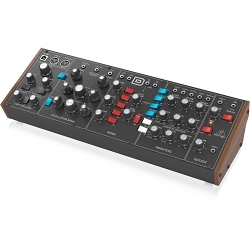 At the heart of the MS-101, lies the authentic 3340 voltage controlled oscillator (VCO), which provides four simultaneously mixable waveforms including saw, triangle, square/PWM, and an octave-divided square sub-oscillator. 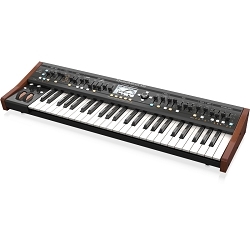 The VCO can be adjusted over a four-octave range (16', 8', 4', 2'), offering remarkable flexibility. The highly flexible voltage controlled filter (VCF) includes faders for cutoff (10 Hz to 20 kHz), resonance (0 to self-oscillation), envelope depth, modulation depth, and keyboard follow (0 to 100%). 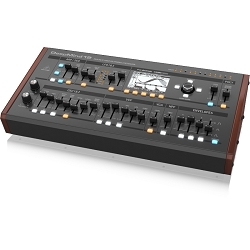 The VCF can be modulated by the ADSR, keyboard tracking, and bender controller. Additionally, the VCF has a dedicated FM source with a wide selection of waveforms for creating audio-rate filter madness. The envelope generator with dedicated faders for ADSR can be used to control the VCA, VCF, and even the VCO, while the dedicated LFO offers a rate fader, waveform selector (tri, square, random, noise), and an LFO rate switch (H, M, L), which can be selected to modulate the VCO, VCF, and VCA as well. 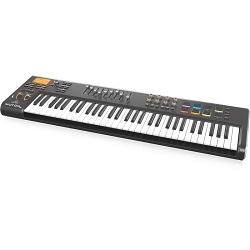 The onboard sequencer allows you to program up to 32 steps and rests and save them into one of the 64 pattern slots, all of which are stored in eight banks of eight. 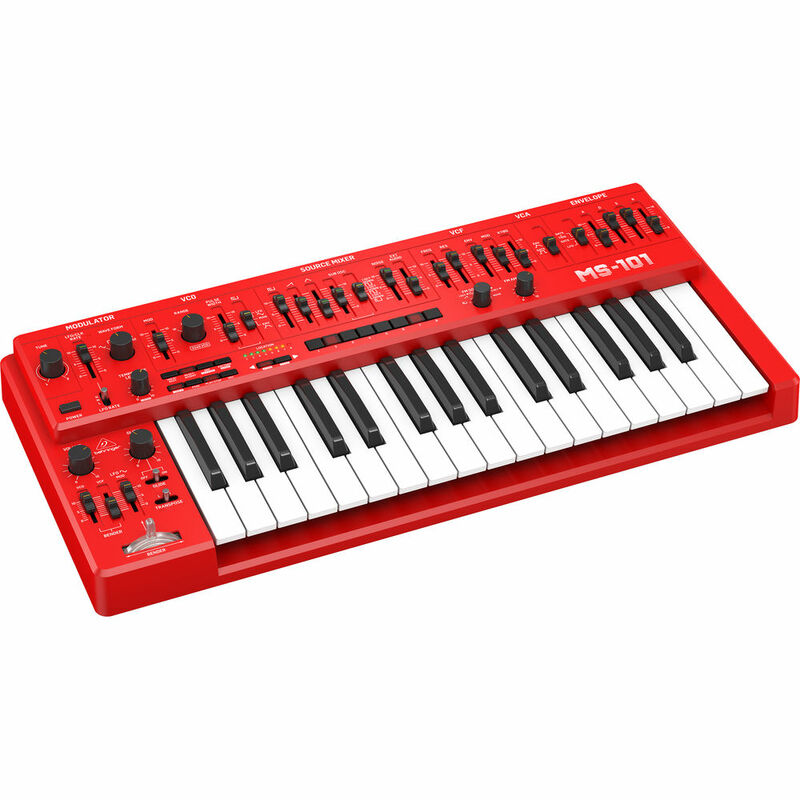 A sequence can be created via keyboard mode or step mode. The onboard arpeggiator features eight patterns you can use just by playing a chord, which the arpeggiator then sequences through your selected pattern. 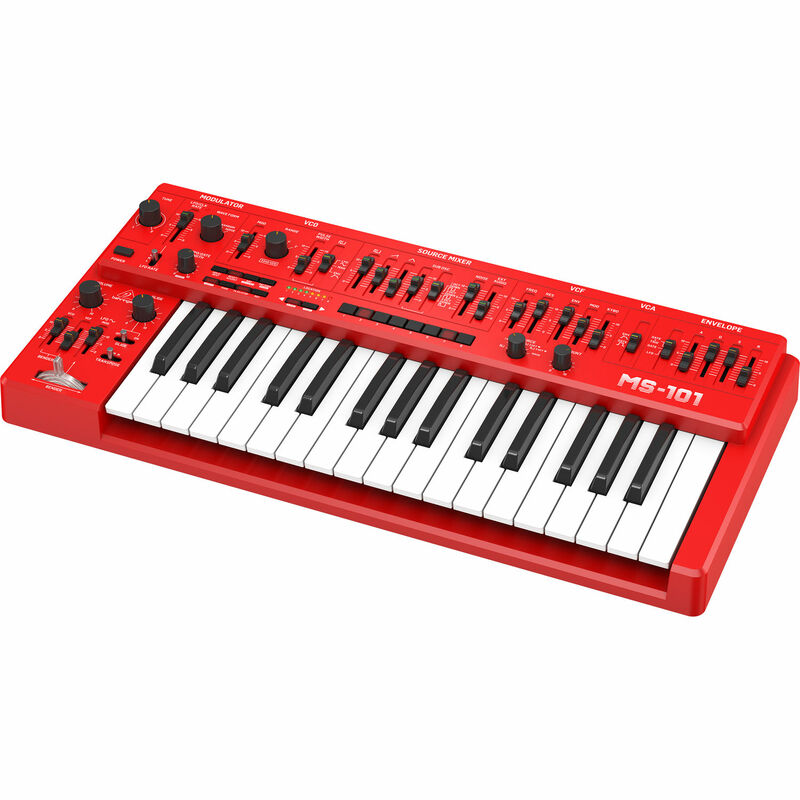 Both the sequencer and arpeggiator in the MS-101 are fun, mesmerizing, and totally addictive. 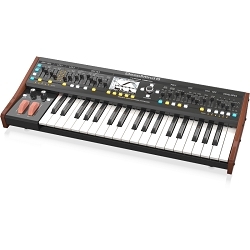 Other notable features include glide (portamento) for sliding note pitches for acid-style leads and bass; an assignable bender that offers control over the VCO and VCF circuits; as well as the pitch mod wheel on the attachable hand-grip. It's even possible to modulate the pulse wave via the LFO, envelope, or manually, for sounds ranging from mild to wild. 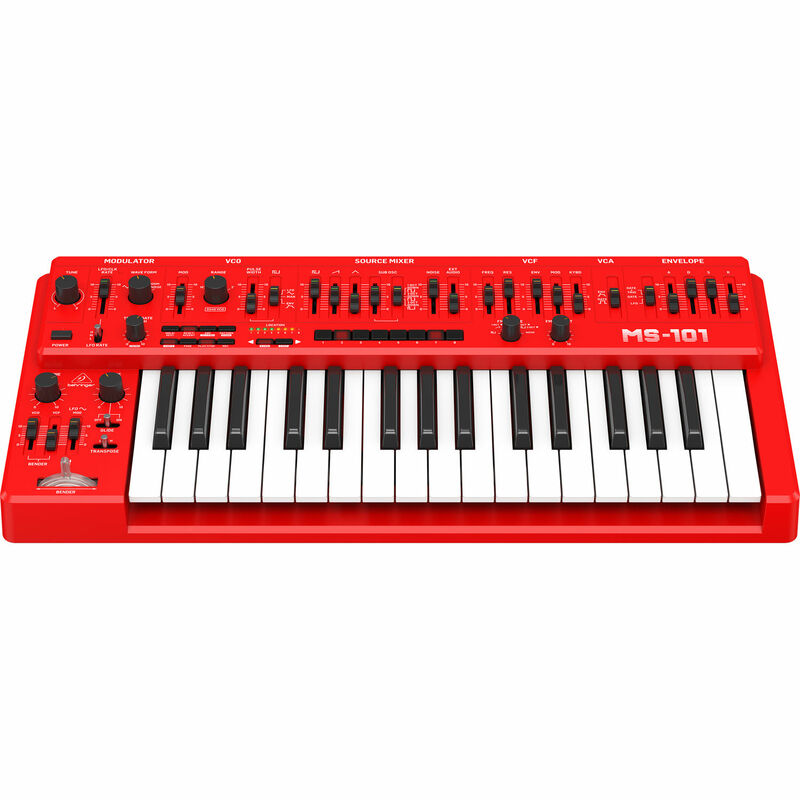 The red Behringer MS-101 includes the performance kit and a power adapter.